The world of the flat screen TV’s has left the world of science fiction behind and is now a regular feature in our homes. Thankfully, we no longer need a huge bracket to mount our televisions on the wall now but with this slimline technology comes a problem. Have you noticed what a deep speaker looks like when it is hung on one of the flat screen TVs? This is where Tangent have come up with a solution. These speakers are a space saving device that have been specifically designed for use with flat screen TVs. 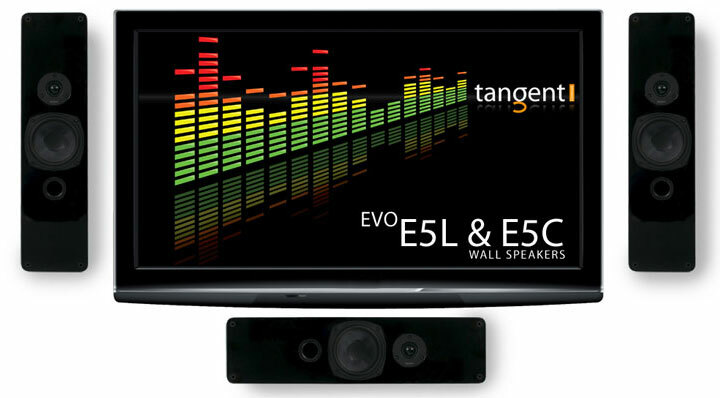 Providing a sound so sublime, you wouldn’t expect it from such a small solution, the bass-reflex construction gives the Tangent EVO E5C speakers a leading edge over its competitors The wall bracket that comes with the speakers allows for easy positioning beneath the television. Available in white and black high gloss, these speakers blend in with any interior decor. It is only natural to treasure our most precious possessions. Gifts from faraway places, family heirlooms – each takes up an important part in our hearts. Just as in love, love of a real treasure is limitless. Tangent customers all share that same love for their collection of music. Wherever they may go they have their music with them, ever eternal, ever growing. Regardless of the technology, their passion and commitment for music never fades. For this reason, Jean-Yves Le Porcher a designer with the Tangent team looked to create a loudspeaker and docking station solution for the Apple products. The PearlBox from Tangent is new this year, it offers amazing sound and glamour allowing the love to continue. Thanks to the auto-detect function the device is recognisable on its own, uses the product’s display and is ready for use. There is no need wait to hear the potent sound of PearlBox as you can just wade through your music collections as usual. Great looks and sound synchronised yet again in a carefully designed Tangent product. Because there are no buttons, one may wonder how the PearlBox can be operated. There are two solutions, either directly or remotely. You can still use your Apple device even when you are utilizing the PearlBox. The ultra modern Tangent PearlBox is available in two stunning high gloss colours; A black cabinet with red interior or a white cabinet with silver interior.